Since Adam and Eve first disobeyed God in the Garden of Eden and brought the curse of sin into this world, the Lord has reached out to offer the human race redemption by His grace. Before the Flood, the spirit of Jesus Christ was working through Noah, calling people to escape from the wicked world into the salvation of the ark. As Genesis 6:5 tells us, “Then the Lord saw that the wickedness of man was great in the earth, and that every intent of the thoughts of his heart was only evil continually.” There was never a more evil generation than the people destroyed by the Flood, and yet verses 19-20 of today’s 1 Peter 3 passage tell us that God still gave that generation the chance to be saved. He reached out to them with the gospel as He still does now, and sadly they all rejected it accept for Noah and his family (“eight souls” in all). He offered to them a clean conscience just as He still offers us today. The message from God has always been the same: Repent, believe in the gospel, and receive from God a new heart of faith and love. They had only the spirit of Jesus to clean their consciences, but it was enough to save people in the time of the Old Testament. Now we have the full revelation of Jesus Christ given by the New Testament. How much more, then, should we be willing to let the “Conscience Cleanser” do His work in our hearts? 19 by whom also He went and preached to the spirits in prison, 20 who formerly were disobedient, when once the Divine longsuffering waited in the days of Noah, while the ark was being prepared, in which a few, that is, eight souls, were saved through water. 21 There is also an antitype which now saves us—baptism (not the removal of the filth of the flesh, but the answer of a good conscience toward God), through the resurrection of Jesus Christ, 22 who has gone into heaven and is at the right hand of God, angels and authorities and powers having been made subject to Him. • The “spirits in prison” discussed in verse 19 is probably talking about the wicked people of Noah’s day who refused God’s salvation and died in the Flood. Their souls or “spirits” are now in the “prison” of hell and can never be set free. The spirit of Jesus preached to them through Noah while these sinful people were still alive, but they spurned His mercy and love and chose to die in their sins. No other verse anywhere in the New Testament gives any indication that Jesus ever preached the gospel to people already in hell. Instead, the consistent witness of Scripture is that once a person dies, it is too late for him or her to repent, believe, and be saved (for a clear example of this teaching, check out the story of the rich man and Lazarus in Luke 16:19-31). 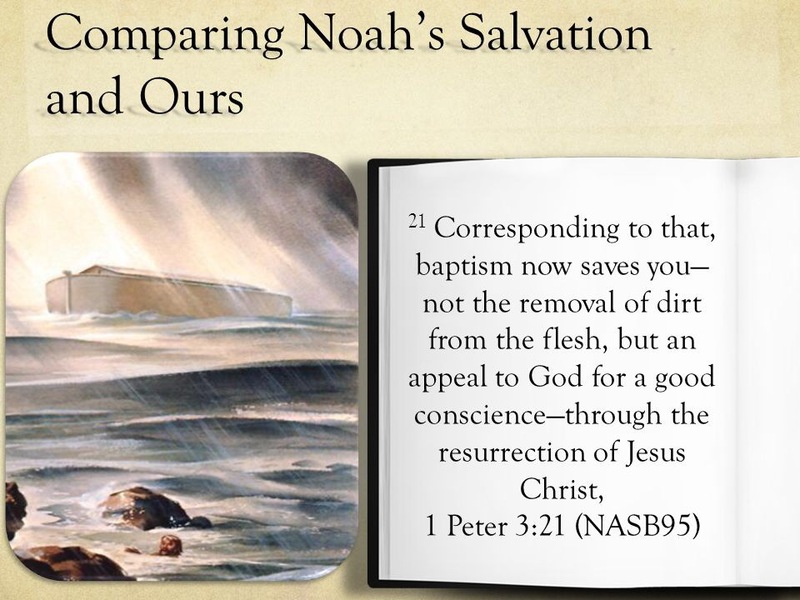 • When Noah’s family passed through the waters of the Flood in the safety of the ark, it provided a picture of the New Testament ordinance of baptism. As Peter says in verse 21, being baptized as a Christian does not save us, but it does provide an important symbol and witness about the cleansing of our hearts by the Holy Spirit that takes place when we accept Christ and are born again as new creations. • Verse 22 reminds us that Jesus is now with the Father in heaven, commanding the angels and waiting to one day return to earth to rule forever in majesty and power. 1. Why do you think it is so important to talk to people about repentance or turning from sin when you are explaining what it means to be a Christian? What is the danger of sharing the gospel of Jesus Christ with someone without talking about repentance? 2. Have you been baptized as a Christian? Why do you think that the Bible teaches that baptism is an important part of the Christian life? Remember when I said a few posts ago that the New Testament authors couldn’t stop talking about what Jesus did for us on the cross? Well, here we go again! Peter has just finished telling us in verses 13-17 to be brave and endure suffering for righteousness’ sake. Before that, he reminded us in verses 8-12 to be kind and forgiving of others, not returning evil for evil. And before that, he encouraged wives with unbelieving husbands to witness to their unsaved spouses by living holy lives marked by gentle, submissive spirits, while reminding husbands to treat their wives with honor and understanding. Now Peter once again gives us the why for these godly behaviors in verse 18. We should be willing to suffer for the sake of others because that’s exactly what Jesus did for us on the cross. He was the righteous one and we were the unrighteous sinners. He was willing to suffer for us even to the point of laying down His life. We were selfish, sinful people. We did not love and obey the God who had made us. We did not deserve His mercy and grace. But He showed us His love by sending Jesus, the just one, to take our place, the unjust ones. By dying on the cross for our sins, Jesus absorbed all of the holy wrath and condemnation that should have fallen on us for all eternity. That miracle changed our destiny and our souls forever. Through our faith in Jesus’ death and resurrection, we received a new nature as God put His own Holy Spirit in us. And now we have the power and opportunity to suffer on behalf of those who have not yet received the salvation we thankfully enjoy. It’s our turn to be the just sacrificing ourselves for the unjust. We aren’t perfect like Jesus, but we are spiritually clothed in His righteousness and charged to act as His representatives offering the gospel of peace to the lost people around us. We may not be called to die so that others can be saved, but we are called to live in a way that encourages others to be saved. We live holy, humble lives so that others might be brought into a redeemed relationship with God through Christ as we have. 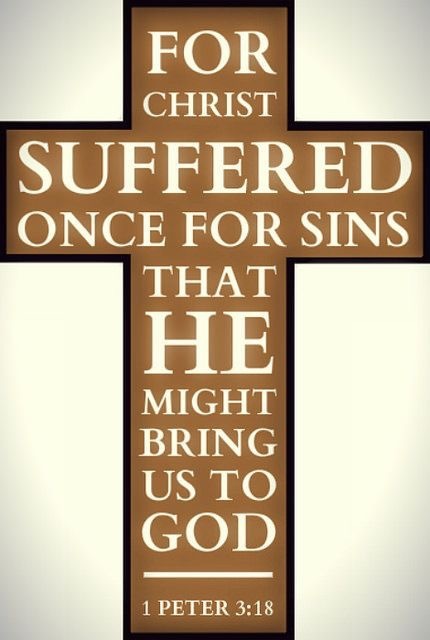 • The concept of Jesus dying for sinners as a substitute is called the “atonement.” He actually took our place in absorbing the just wrath of God for our sins. God could not just overlook our sins – they had to be paid for with the blood of His Own Son. This sacrifice in our place made it so we could be “at one” with God, being placed in a right relationship with Him through faith. • Jesus died in His human nature, or the “flesh,” but it was His God nature, called in verse 18 “the Spirit,” which raised His body from the dead. Understanding “the Spirit” in this verse as referring to Christ’s deity will help us make sense of tomorrow’s more difficult to understand passage (verses 19-22). Be sure to check out tomorrow’s post for the connection! 1. How are you handling the sufferings and trials of your life right now? How could today’s verse help you handle them better? 2. Confession is an important part of our walk with God. Take some time to think about the sins that you have committed today or this week. Ask God to help you see how much He has forgiven you of through the cross. Let Him turn your confession into joy and thanksgiving as you appreciate His mercy and grace again. Living at peace with God by humbly obeying Him will often lead us to be at peace with other people. Our good behavior and kindness to others will usually lead them to treat us better. But even if we suffer for our faithfulness to Christ, we are still blessed because our lives can become a platform for the gospel. When we keep our peace even as others make fun of us or exclude us for doing what’s right and refusing to join them in doing wrong, we draw curious looks. “How can they be so joyful in the midst of such persecution?” the lost observer asks. Eventually these confused onlookers may ask us about our faith, and then we get a chance to tell them about our Lord and Savior Jesus Christ. 13 And who is he who will harm you if you become followers of what is good? 14 But even if you should suffer for righteousness’ sake, you are blessed. “And do not be afraid of their threats, nor be troubled.”15 But sanctify the Lord God in your hearts, and always be ready to give a defense to everyone who asks you a reason for the hope that is in you, with meekness and fear; 16 having a good conscience, that when they defame you as evildoers, those who revile your good conduct in Christ may be ashamed. 17 For it is better, if it is the will of God, to suffer for doing good than for doing evil. 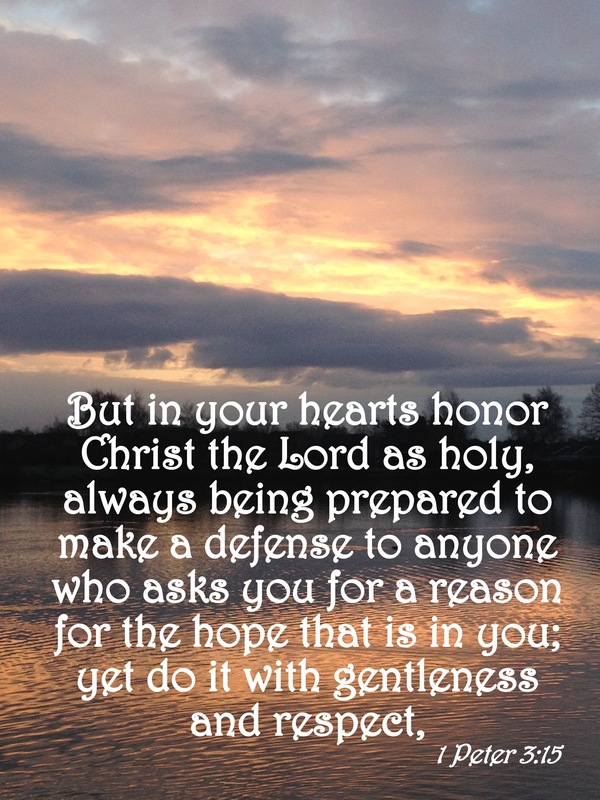 • The challenge in today’s verses is to both show Jesus to others in how we live and to remain always ready to share Jesus with our words. Both types of witness are important tools that God uses to persuade people to come to a saving faith in Him. Daily study of God’s Word can help you with living a godly life by keeping Christ first in your mind. It can also help you with explaining your faith to others as you learn what the Bible teaches and how it applies to our world today. • A key theme in 1 Peter is that we should joyfully endure suffering for doing good while seeking to avoid causing suffering by our sin. We saw this concept in a similar passage in chapter 2 and Peter will return to it again in later passages. Clearly, suffering for our obedience to Christ is something that we should expect as Christians. The issue is not if we will suffer persecution, but how we will respond when the persecution comes. 1. With whom are you trying to share your faith right now? How could your life be a stronger witness to the these people? 2. Do you know how to share your faith with others? One great way is the “Share Jesus Without Fear” method. A link is provided below or you can get Mr. Reel to show you the method during lunch on Tuesdays or Wednesdays (he has been already teaching it to small groups of friends. If you have learned another way, that’s awesome. There are many evangelism methods out there; the most important thing is to pick one that is biblical and then learn it and start using it. 3. The best place to begin sharing your faith is with people with whom you already have relationships – friends, family, teammates, and neighbors. Can you think of some people that God has placed in your life with whom you might be able to share your faith soon? Start praying for opportunities to witness to them and for God to prepare their hearts, and then be ready to obey God when He opens doors for the gospel. 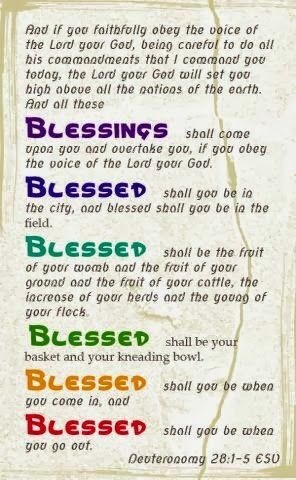 Do you want to live a blessed life? Do you want to please God and enjoy His favor? Do you want to know and do the Lord’s will? Then be a blessing to those around you. Show love to your brothers and sisters in Christ. Have care and compassion for each other. Don’t take revenge when others do you wrong. Don’t even desire revenge. Instead, forgive those who have wronged you by remembering how much forgiveness God has given you. Don’t gossip or complain about others, but rather build others up with kind words of praise and respect. Peter wrote these truths to the suffering believers living in the first century Roman Empire but also to Christians today. We don’t suffer through the same persecution and hardships as those Christians. But like them, we are humans made in God’s image, corrupted by sin, and redeemed by the blood of Jesus. They apparently struggled with getting along with each other, and so do we. Sometimes they offended and hurt each other and needed to seek each other’s forgiveness, just like we do today. They needed to be challenged to walk in God’s love and live out their faith daily in their relationships with each other, and so do we. Why should we want to bless each other in the ways that Peter describes in verses 8-11? Because we want God’s hand of blessing and mercy on us instead of His rod of discipline and correction. When we obey our Father, we stay under the protective umbrella of His grace. His eyes of favor and blessing are on us. His ears are open to hear our prayers. This does not mean that our life on earth will be easy or that we won’t face difficulties and pain. In fact, tomorrow’s passage will talk again about how we should understand and endure suffering as followers of Christ. But enjoying God’s blessing means that He is with us. We get His peace in the middle of trials. When we are striving to please God and turn away from sin, we get His smiling face of approval. And for the Christian, that is the greatest blessing of all. • Peter’s challenge about “not returning evil for evil” is just like what he had heard Jesus say in the Sermon on the Mount. “But I say to you,” said Jesus, “love your enemies, bless those who curse you, do good to those who hate you…that you may be sons of your Father in heaven” (Matthew 5:44-45). If we must forgive and love even our enemies, how much more should we forgive and love our brothers and sisters in Christ? • Verses 10-12 are a quotation of Psalm 34:12-16. It is amazing how often the New Testament writers quote or paraphrase the Old Testament, especially the Psalms. This shows us that they knew their Scriptures very well, which for them meant just the Old Testament, and that these Scriptures were able to make them “wise for salvation through faith which is in Christ Jesus” (2 Timothy 3:15). If we want to grow our relationship with the Lord, then we should study both the Old and New Testaments with hearts open to doing God’s will. 1. In what ways have you enjoyed God’s blessing as a result of obeying Christ and His teachings? Can you think of some specific examples from your recent past? 2. When do you feel like you have experienced God’s discipline as a clear result of your sin? What happened? How did you know that it was God’s discipline and not just a trial to build your faith? 3. Can you think of a time when you wanted to get revenge against someone but instead chose to forgive him or her? What were the consequences of your godly decision? God calls men to be leaders in their families and to treat women with gentleness, understanding, and honor. That concept is taught and modeled throughout the Bible. God made Adam first, and then He made Eve to be His helper. In the Garden of Eden, “the Lord God said, ‘It is not good that man should be alone; ﻿I will make him a helper comparable to him'” (Genesis 2:18). When Eve and then Adam sinned in chapter 3 by eating the forbidden fruit, God spoke to Adam first to ask what he had done because Adam was the leader and he had failed to protect his wife from Satan’s tempting. Several times in the New Testament letters, husbands are told to “love their wives” sacrificially, the same way that Jesus loves His church (Ephesians 5:22, Colossians 3:19, and today’s verse, 1 Peter 3:7). Men are not to abuse their roles as leaders, but to humbly and lovingly guide their families to follow Christ and His commands. Our middle school and high school guys are not yet husbands and fathers, but most will be some day. Even for those who will remain single, they still have an obligation to learn to treat all women right. Now is the training time. Because of their love for Jesus, our guys should treat all the women in their life as 1 Peter 3:7 commands, with kindness and respect. This includes your mothers, sisters, female teachers, and friends. The young man who says that he is a Christian but consistently disrespects the females in his life is disobeying and dishonoring Jesus. Such a man will not enjoy God’s favor and blessing. The cool thing is, though, that the more that you practice being nice and gentle to women, the better you will feel as you walk in God’s peace. They will actually be nicer back to you, too! For the Christian, obeying God brings joy into your life and the lives of those around you. God also has a plan for women. He calls them to develop sweet, gentle spirits. Yes, that includes wives submitting to husbands, not as slaves but as people who are equal with men before God yet not given the leadership role in the family. By humbly following the leadership of their husbands and treating them with respect, wives show Jesus to their husbands. Peter says that a quietly godly wife can sometimes even end up persuading an unbelieving husband to submit to Christ and become the spiritual leader of the family that God wants the man to be. Our middle and high school girls are not yet wives, but like our young men, they are also in training for the future. Instead of obsessing over how they look and dress (which is often more about impressing each other than the young men, who usually don’t know or care much about fashion – just saying), young ladies should develop their hearts for God. Why? Because your heart is what God cares about; “man looks at the outward appearance, but the Lord looks at the heart” (1 Samuel 16:7). And a gentle and loving heart for God is also what a true godly young man will care about when you start dating in late high school or college. Imagine what an awesome school we would have if all of our students were pursuing biblical manhood and womanhood! Don’t waste your teenage years living like so many careless fools. Use this time to start becoming the man or woman that God has made you to be. 1 Wives, likewise, be submissive to your own husbands, that even if some do not obey the word, they, without a word, may be won by the conduct of their wives, 2 when they observe your chaste conduct accompanied by fear. 3 Do not let your adornment be merely outward–arranging the hair, wearing gold, or putting on fine apparel– 4 rather let it be the hidden person of the heart, with the incorruptible beauty of a gentle and quiet spirit, which is very precious in the sight of God. 5 For in this manner, in former times, the holy women who trusted in God also adorned themselves, being submissive to their own husbands, 6 as Sarah obeyed Abraham, calling him lord, whose daughters you are if you do good and are not afraid with any terror. • Submitting to the leadership of their husbands and other male leaders does not make women cowards or doormats. Biblical submission is actually a sign of spiritual strength and bravery (look at the end of verse 6). It also does not mean following a husband into sin. If the husband is not a Christian, the wife should still do her best to encourage the faith of her children in a respectful way. That would include doing her best to get the children and herself to church each week whenever possible and spending time with God herself each day. Of course, for our students (who are not yet married), the key is to make sure that you know your boyfriend’s or girlfriend’s Christian testimony before you commit to marrying him or her. Looks will fade and cease to impress, but true faith will grow and become more beautiful with time. • Peter’s reference in verse 7 to women being the weaker vessel is probably talking about them being less strong physically and perhaps also emotionally. Men should not take advantage of their stronger bodies or better control of their emotions, but instead show compassion and understanding towards women. This would include husbands protecting and supporting their wives and fathers protecting and supporting their daughters. When the man of the house follows God, he acts as a spiritual anchor for the whole family. When dad follows Christ, the whole family will usually end up following Christ. • Verse 7 also shows that for a man to stay right with God and have his prayers answered, he must be treating his wife with love and honor. For our male students, if you have been disrespecting your mother, sister, female teachers, or other ladies in your lives, you will need to ask forgiveness and make those relationships right to restore your fellowship with Jesus. God will feel distant and far away until you deal with your sin against the women you should be respecting. 1. For the young men, how are you treating the ladies in your life right now? Are there any relationships that you need to make right? 2. For the young women, are you focusing more on your physical appearance or on your heart right now? How can you tell? 3. How can you begin preparing now to have a biblical marriage in the future?